. . .Her aunt immediately moved on, but not before Valancourt had reached them, who bowed lowly to Madame Cheron, and with an earnest and dejected look to Emily, with whom, notwithstanding all her effort, an air of more than common reserve prevailed. The presence of Madame Cheron prevented Valancourt from remaining, and he passed on with a countenance, whose melancholy reproached her for having increased it. Emily was called from the musing fit, into which she had fallen, by the Count Bauvillers, who was known to her aunt. 3.5 stars for this classic gothic novel. Every author and aspiring author should read this book. Not because it is a great book (it really wasn't) but because they will look at their proofreaders, copy editors and beta readers with a whole new appreciation! I chose to read this book the same way many other people did. I was reading the Jane Austen novel Northanger Abbey as part of a group read, and the topic of 'The Horrid Novels' came up. 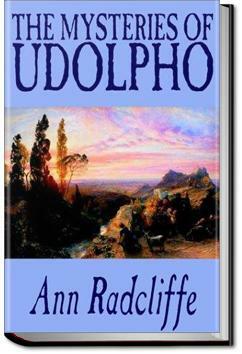 The Mysteries Of Udolpho was the only one I had access to, so it was the one I read. "'You speak like a heroine,' said Montoni, contemptuously; 'we shall see if you can suffer like one.'"